The social media aspect is actually a distraction from deep-rooted issues and the real story, which is chronic economic malaise and the growing disparity between rich and poor in Britain, just as was the case in the Arab uprisings. The United Kingdom has a population of about 61 million and roughly 62.5 million cell phones, and the latter number is expected to continue to increase. Many people have one phone for personal calls and another for work. Social media, particularly the BlackBerry Messenger (BBM) app, were apparently heavily used to coordinate activities such as looting and to avoid authorities. Research In Motion, the company that manufactures BlackBerry smartphones, has agreed to help police track users who may have incited violence. British Prime Minister David Cameron is now targeting the “riotous assemblies” via social media and other online communication. A number of arrests have been made based on Facebook and Twitter messages. Authorities have taken to using social media themselves in order to identify criminals. They are posting photographs on Flickr and scanning the Web for clear photographs of rioters’ faces. Grant Byrne, a student nurse living and training in Glasgow, said he learned of the riots initially on Facebook, then went to the BBC News website for confirmation. But days into the riots, he decided to start a Facebook page to call for the disturbances to be referred to as English, not the wider U.K., as no trouble had taken place in Wales, Northern Ireland, or Scotland. Meanwhile, coverage of the events have exemplified once again the need for citizen journalism in a changing media landscape. Gaz Corfield, journalism student at Brunel University, is the editor of hyperlocal site The West Londoner. 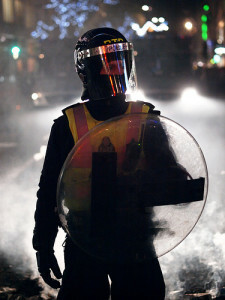 The site’s liveblog of the riots achieved one million views in just 24 hours. Corfield credits the popularity of liveblogging to its speed and accuracy of coverage. “When the situation is fluid and still developing, readers want immediate updates,” he says. He also explains to Journalism.co.uk the importance of sticking to factual reporting, avoiding speculation, and refusing to report rumors. On the flip side, social media is also being used to mend the disrepair after the riots. It has been used not only to correct inaccurate information, but also to provide a medium for community commiseration. It’s also been a method of communication about helping victims of the looting and to clean up debris and other aftermath of the riots. 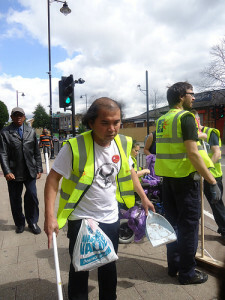 Image of London Riots Clean Up by Burma Democratic Concern, used under its Creative Commons license.